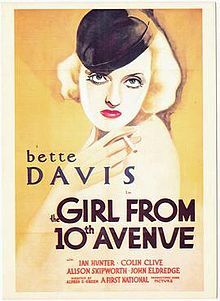 THE GIRL FROM 10TH AVENUE is an entertaining film starring the young Bette Davis as a girl from the "wrong" side of town who marries a society lawyer. Davis plays Miriam Brady, who meets wealthy Geoffrey Sherwood (Ian Hunter) when he's drinking himself silly over losing Valentine (Katharine Alexander); Valentine has thrown Geoff over to marry the even richer John Marland (Colin Clive, HISTORY IS MADE AT NIGHT). Miriam sticks with Geoff during his bender and the next thing you know, they're married. Miriam plans to get an annulment and chalk it all up to being a big alcohol-fueled mistake, but the couple like each other's company and end up deciding to stay together. Geoff quits the legal profession and devotes himself to starting an oil business, while Miriam's landlady, Mrs. Martin (Alison Skipworth), gives her books to read and helps Miriam to employ a more refined vocabulary. Miriam, who is quickly growing to love Geoffrey, does her best to be a thoughtful wife and make Geoff proud of her. THE GIRL FROM 10TH AVENUE is a fast-paced and enjoyable 69 minutes. One of the things I especially liked is that while the lead couple have problems, everything is open and aboveboard; they don't keep secrets, but immediately discuss their meetings with Valentine and John. This makes both characters more likeable and sympathetic. Geoff is a bit dense about recognizing his feelings for Miriam, but he has a couple excellent scenes with Colin Clive and Katharine Alexander near the end where he makes his true loyalties clear. I really enjoy the early "pre-diva" Davis films such as this title, BUREAU OF MISSING PERSONS (1933), FOG OVER FRISCO (1934), SPECIAL AGENT (1935), and FRONT PAGE WOMAN (1935). 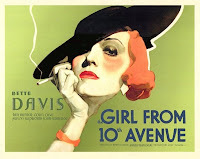 Davis's intense energy helps snap the plots to life and makes even fairly inconsequential stories engaging and enjoyable; THE GIRL FROM 10TH AVENUE is no exception. In addition to Davis, the film has a good cast. 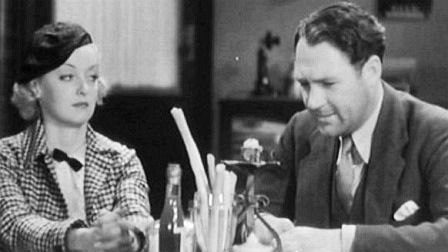 Ian Hunter is a bit stolid, but I have a soft spot for him since he was King Richard in THE ADVENTURES OF ROBIN HOOD (1938), and his personality seems right for this part. Alison Skipworth is quite amusing as Miriam's mentor, who was once a showgirl with extensive dealings with the upper crust. I've always been fond of Katharine Alexander, and while she's playing the other woman in this, she's part of the movie's best scene. Miriam and her friend Mrs. Martin go to lunch and stare down Valentine, who's lunching with friends. In a hilarious moment, Valentine becomes so flustered that she ends up hurling a grapefruit at Miriam. (Warner Bros. seems to have had a thing for grapefruit!) The scene was even more fun for me as bit player extraordinaire Bess Flowers has a significant speaking role as Valentine's friend; I always get a kick out of Flowers turning up in one of her 830+ roles. Incidentally, Alexander's wedding headgear rivals that of Rosalind Russell in MAN-PROOF (1938) for the oddest wedding outfit I've ever seen! And was it normal for high society folks to marry at "high noon" on a Tuesday? Marrying in the middle of a weekday seemed a bit odd to me, but perhaps some of the monied folks in attendance didn't need to bother to work. 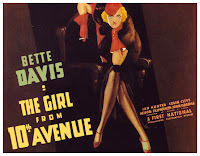 THE GIRL FROM 10TH AVENUE was directed by Alfred E. Green. 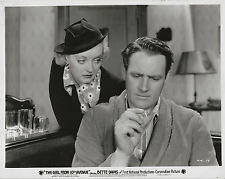 The Charles Kenyon screenplay was based on the play OUTCAST by Hubert Henry Davies. To its credit, the movie doesn't feel like a filmed stage play in the least. The supporting cast also includes Phillip Reed, John Eldredge, Helen Jerome Eddy, and Edward McWade. Look for Mary Treen as a secretary. The clerk at Geoff's club seemed familiar, and then I realized he was Gordon Elliott, later the "B" Western star known as Wild Bill Elliott. 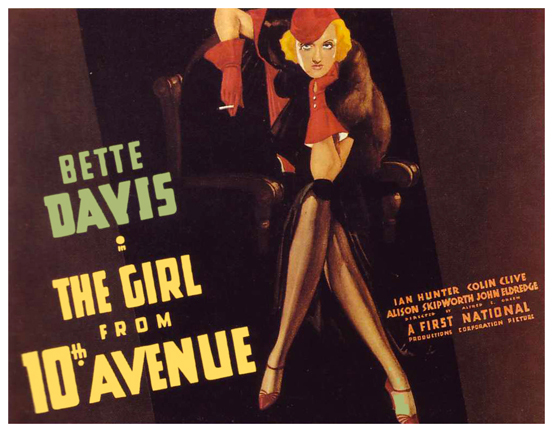 THE GIRL FROM 10TH AVENUE is available from the Warner Archive. It can also be seen on Turner Classic Movies. The trailer is on the TCM website.